In September 2015 KSB Group will extend its tried-and-tested Multitec type series: the new high-pressure pump Multitec DN 200 will be available with four different hydraulic systems and two to six stages. It is designed for casing pressures of up to 40 bar and suitable for use in water supply, irrigation, pressure boosting or fire-fighting systems. Its maximum head is nearly 400 m and its maximum flow rate is 850 m³/h. The pumps are driven exclusively by four-pole three-phase motors with a maximum power rating of 1000 kW. 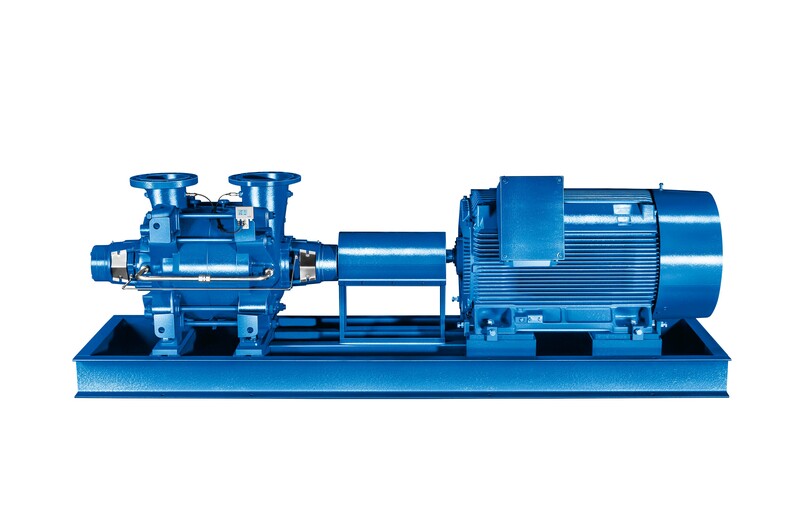 The advantage of the new pumps compared with higher-speed pump sets with smaller nominal diameters is that, running at 1450 (50 Hz) or 1750 (60 Hz) rotations per minute, they will reach the same maximum flow rate, yet run much more quietly. Their low rotational speeds help reduce wear and have a positive impact on both the service life and the efficiency of the pump set. Energy efficiency, a long service life and low noise emissions are very important to customers in the water sector. The maximum temperature of the fluid handled should not exceed 60 °C. The pumps sets have a maximum weight of 1.6 tonnes, with casings made of nodular cast iron and impellers made of bronze. To cover as broad a spectrum of applications as possible, the pump sets can be equipped with a variety of standardised single mechanical seals or gland packings. The diffusers can be supplied in grey cast iron or bronze, and their transition areas are protected against wear by casing wear rings. The pump shaft is supported by ball bearings at both ends. Being generously dimensioned and equipped with flow-optimised hydraulic systems as well as easily replaceable wear parts, Multitec DN 200 offers a high degree of operating reliability at low energy and maintenance costs. The Multitec pump can be supplied for horizontal or vertical installation. The pump manufacturer's French factory at Châteauroux is expected to supply the first twelve pump sets of the new type to a water project in Algeria in March 2015.